Way back in September last year, I was contacted by a fellow Aussie polish addict Angela who had been selected as a finalist in the RBL Fan Collection 3.0. I did a shout out to try help her get some more votes. In the end she secured just enough votes to have her polish created, and it was finally released last month. In case you haven't heard, RBL has since shut up shop. No more blog, no shop, nada, gonski! RBL was one of the very first indies, so it's sad to her her gone. She was certainly the first brands to ever do collaboration shades. I'm not even sure where you can pick up these polishes any more. But I'm super lucky, because Angela wanted to send me a bottle of the polish he helped create, if I was interested. Are you serious! Of course I'm interested. This is such an amazing polish that photos do no justice for. I've looked at a lot of photos in reviews of this polish, and they are look similar to this, whereas in real life this textured polish is so sparkly! Firstly I want to take you back to the concept board and the inspiration that Angela submitted. "My Motherland, my country, my island home...my Australia. Rich in natural wonder, indigenous culture and diverse landscapes, many associate Australia with vast blue sky, turquoise oceans and lush green rainforests...and for good reason. But there is another side to the palette of this magical island continent. The black volcanic rock that shaped so many landscapes, holding the memories of the fiery lava that created it within. The black of its desert sky. The glowing orange of its sunsets. The red ochre of its outback soil. The black of its native bush forests after they have been ravaged by scorching bushfire. And the mystical hues of Uluru, or "The Rock" as it is nicknamed, which literally takes centre stage in the middle of this huge land. Uluru magically responds to its environment by changing from orange in the light of day, black when it rains, to glowing red at sunset. The poem concludes with the author declaring "Though earth holds many splendours" Australia is the only country for her. This work resonates deeply with those of us who hold our land dear. 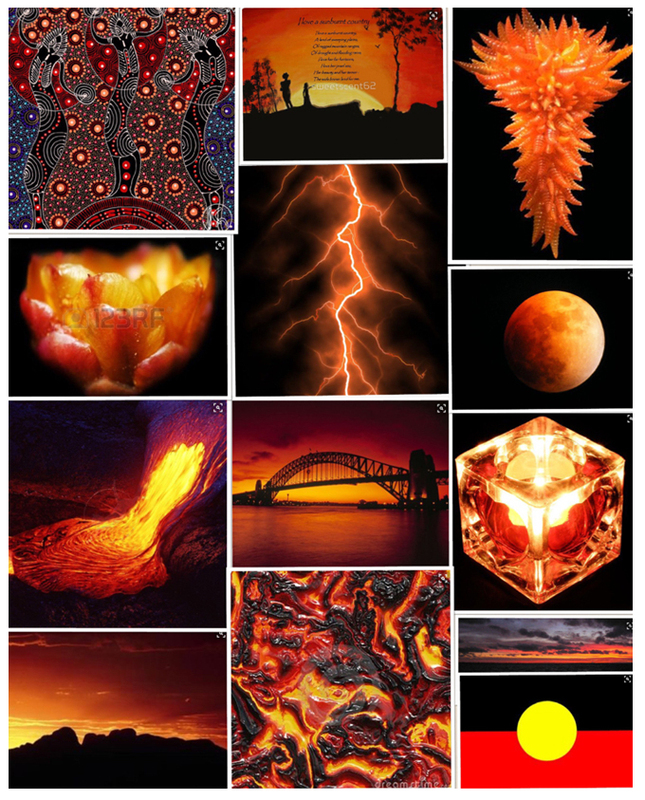 I envisage "Many Splendours" as been a night-sky black polish that, like Uluru, responds to its environment revealing fiery flashes of red orange from within. "Many Splendours" could be thought of as a darker sister to my beloved bottle of Piu Mosso, however like the island that inspired her, she will be truly one of a kind." 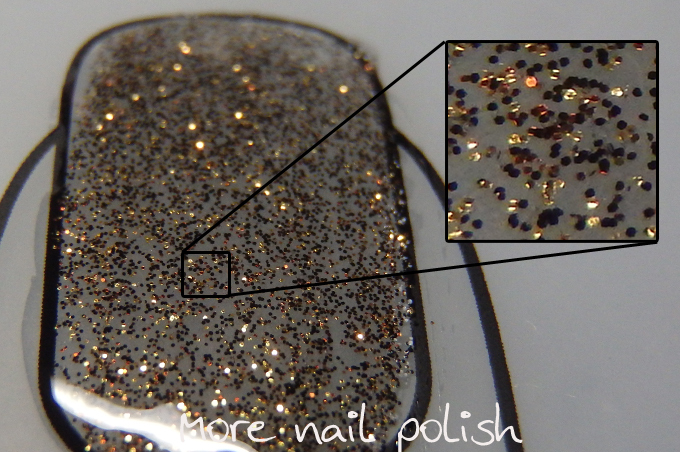 The polish is made up of tiny black, gold and orange glitters, as well as texture stuff in a black jelly base. It's interesting how the black, gold and orange glitters combine to give an overall sparkly brown appearance, especially as polish has no brown in it. But you have to trust me when I say this has such much more life to it when you see it in person. I was surprised to find this was a textured polish, because in the bottle it looks so sparkly and smooth. But I actually like that it's a texture, because if you have ever traveled to central Australia you'd know that that damn red dirt gets everywhere, and it makes me think of that! I definitely think RBL nailed the vision Angela had of a night sky black polish with fiery flashes of red and orange. This is two coats, and it's coverage is very good. It dried quickly for a texture and lasted well on my nails. Here is a macro shot of a single layer of the polish on my UberChic mat. I also tried it with top coat, and it's even more beautiful. I did three layers to ensure it was totally glassy smooth. Thank you so much to Angela for gifting me this beauty.